Pictured: Enda O’Coineen, President, Irish Pubs Global, Minister for Diaspora Affairs, Jimmy Deenihan and Donal Ballance, Ballance Hospitality. Minister for Diaspora Affairs, Jimmy Deenihan, hosted the Irish Pubs Global patrons and member trustees at a ‘Round Table’ review at the Department of Foreign Affairs and Trade in Iveagh House, Dublin on Wednesday 20th January. 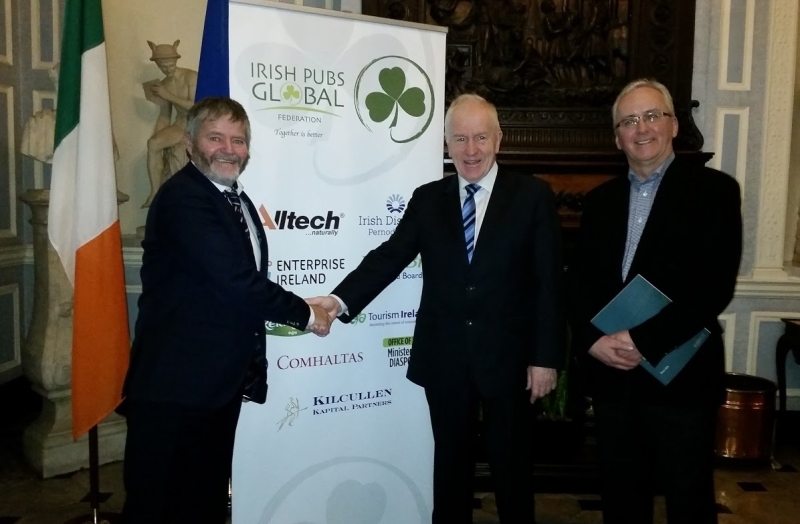 2015 Irish Pubs Global Federation activities were reviewed and plans were discussed for 2016 – the highlight of which will be the Global Gathering this September in Dublin of Irish pub owners and managers from around the world. John McDonald of Mediateam, chaired the meeting which saw many key areas discussed such as staff exchanges between pubs, quality awards, twinning, setting standards, sourcing Irish products and ways to support and help Irish pubs developing their business in different parts of the wold. Minister Deenihan complimented the fact that Tourism Ireland, Enterprise Ireland and Bord Bia, three leading government agencies, are patrons of the Federation and that several private sector companies such as Alltech, Irish Distillers, Ornua and Kilcullen Kapital Partners are patrons of what is developing into a strong Irish Global Hospitality Network. While adding strong support for the development of the Federation and standards, he said that as community centres, places for good food, hospitality and of course the best of Irish beverages, the pub is central and must reinvent as part of a new Ireland embracing and taking a more mature and responsible approach to drink.